Cathy's Card Spot: Say it with flowers. Hi everyone, I was asked to make an anniversary card that was a simple floral one, preferably red! They didn't really want butterflies, but an accident with some distress ink meant I had to cover it up! I've used this die a lot lately but it is one of my all time favourites! I've coloured the stem with distress markers and the red is diecut from a scrap of watercoloured paper, and I do mean a scrap!! I'm linking up to the anything goes challenge at Simon Says Stamp Wednesday. At Allsorts the theme is Let's Celebrate. At Addicted to Stamps & More, the theme is anything goes. Simon Says Stamp Fresh Daisies die; Memory Box Butterfly Delights die; distress markers; Kuretake Gansai paints; Stately embossing folder; sentiment sticker. A beautifully crisp and elegant creation and perfect for our Celebrate theme at Allsorts, many thanks for joining in. It may be simple but it is lovely. It's always great when you can save a card and you did it great! Unlike you I haven't used these flowers in a while - what a shame as they are so beautiful! They make your CAS card shine! I think the little butterflies are the perfect finishing touch! Beautiful card Cathy, love that flower die cut. One of those dies I should have bought, was sold out each time then just never got to it. Its so delicate and perfect with your watercolour piece. 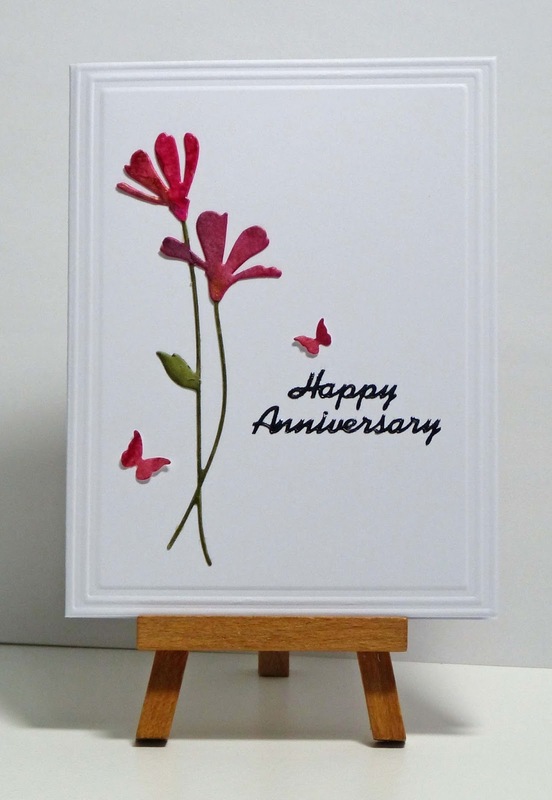 I've always loved that Daisy die, and your added butterflies make this just the perfect card! thank you so much for entering in our celebration challenge at Allsorts this week! Oh Cathy this is one lovely card, those flowers simply pop!! !